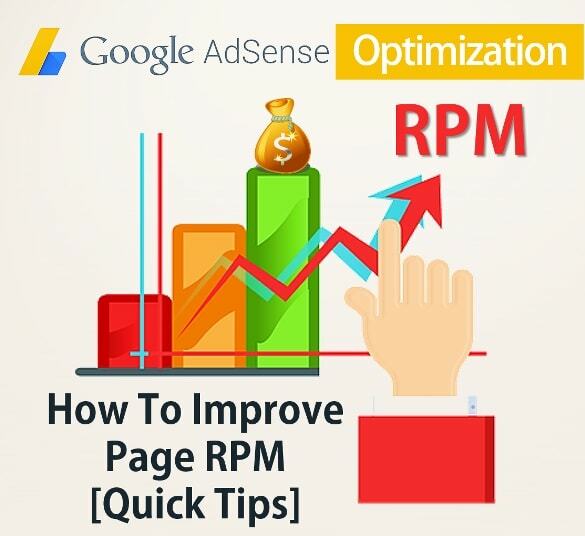 Check out the updated new ways to improve AdSense rpm. The term page RPM (Revenue Per Mille) is no longer unknown term for you now, as we have well known it as an Adsense terms & definitions. Page RPM is not an amount that you are going to get paid; rather it's just used to measured value that shows how much you are going earn for 1000 ad impressions. Notice the difference that the effective CPM (eCPM) is measured with PAGE impressions while RPM is calculated by AD impressions. Just like the smart ways to improve Adsense CTR/CPC, These are the best ideas to increase Adsense RPM that you need to follow. Basically, the Page RPM is only determined by the estimated earning which is increased; depending on how much amount the advertisers are inclined to pay for the ad impressions. So as the amount is varying, the page RPM also varying frequently. That is why, as a publisher that you making money with Google Adsense program, you need to keep an eye on the fluctuating figure shown by page RPM. At this time, I consider one smart way to boost RPM, if you are looking for improving Adsense RPM quickly, just make sure you are allowing best (high paying) advertisers on your website, by barring or adding any low paying advertiser from your AdSense account settings. Moreover, it might be advantageous for you to attach Google Analytics with your AdSense account. This will show you to check from where the improvement in the earnings is coming from. Frequently it occurs when a page on the website rises suddenly in search rankings. In case, if your organic search count has increased, they are much more likely to click on AdSense ads if they are arriving from Google than the social sites or a referred or traffic buying site. The visitors for the Google search are very targeted to the topic of your page. Instead of searching about how to get clicks on Adsense ads learn how to increase Adsense rpm average. Before going into learning the quick tips and tweaks you need to know basic Adsense terms & definitions that every blogger or publisher can ignore. There is no doubt that the Google AdSense Is The BEST To Make Money Blogging and that is why most of users and you are here to read about to increase estimated earnings by improving Adsense RPM. Previously we have seen how to improve your CTR, CPC & eCPM. In addition to that series, this article has got written. If you are looking to make money with these all of these Ad CPC, PPC or Google Web Ads networks effectively, then you need to know the basic ideas that are explained below to get money from ads; so that you can then check & experiment on how to improve your website or blog with proven techniques of Adsense optimization to improve your RPM that force to increase your estimated earnings. Try to publish updated and innovative information with properly managed keyword & layout without any grammatical and spelling mistakes. 2. Always Focus On Improving Organic/Search Engine Traffic. The polished articles fetch more organic traffic. The RPM can be improved by using high paying keyword but relative ones that don't disturb the quality of content. Concentrate on writing original, fresh and quality content to generate targeted traffic. Selection of high CPC keywords is also more effective for the increase in Adsense Earnings. Try to add high paying keywords that are correlated to the content to be published. The higher a keyword pays; makes higher PPC rate & it marks the higher revenue. Keep practice to check Google webmaster tool frequently. It's one of the best Free Search console tool ever made for analyzing the crawling structure of any site. Adsense display ads are graphical ads appeared in different ad formats. And Page views are most responsible for improving RPM. You should reduce the no. of ads or cutting those ads which are not performing well exposed by Adsense Ad Review Center control panel. Furthermore, recommending to make use of custom channels. The Google ad impressions is the most important factor to consider while placing many ads on the site. Follow auto ad display max. no. of ads per page using ad optimization techniques by using Ezoic - Ad Optimization Program certified by Adsense. It's not that much easy to know how much does Google ad words cost. But via Adsense Ad Review Center you can check and remove low CPC paying advertisement companies and also allow high CPC ads but you must try to display related ads to your niche. Increase Adsense Earnings with the help of Google analytics. All clicks and all impressions should be monitored. You must be there in attention to prevent any invalid click activities. You can target your audience from Google webmaster tool. Target US, Canada, Australia, UK these are one of the foremost locations as compared to Asian to generate high revenue and that will help you to improve your page RPM. I think that many tips are sufficient, you don't need to concentrate more on learning about page RPM or any other part of SEO in deep. The search engine will show you all those things for FREE. You moreover, cannot control your impressions & also clicks or how much the advertisers are going to pay for the ads with high CPC, I would recommend the best way to improve your earnings is TO INCREASE YOUR TRAFFIC. The more organic traffic reached naturally on your site means you will have more clicks and thus it will improve CTR, CPC & eCPM. So ultimately that will have the major effect of improving page RPM.